The National Library of Medicine. Frankenstein: Penetrating the Secrets of Nature. http://www.nlm.nih.gov/hmd/frankenstein/franktable.html. Accessed June 14, 2009. Bedini SA. The Role of Automata in the History of Technology. http://xroads.virginia.edu/~DRBR/b_edini.html. Accessed June 14, 2009.
http://www.geocities.com/Hollywood/Academy/9657/GMelies.html. Accessed June 14, 2009. Bush V. 1945. As We May Think. The Atlantic Monthly. http://www.press.umich.edu/jep/works/vbush/vbush0.shtml. Accessed June 14, 2009. Xin M. Ancient Science and Technology: Tang Dynasty. http://www.pureinsight.org/pi/articles. Accessed June 14, 2009. Xin M. Ancient Chinese Technology: Robots. http://www.pureinsight.org/pi/articles. Accessed June 14, 2009. Ran S. Ancient Chinese Technology: Han Zhihe, Ingenious Craftsman Who Created Flying Mechanical Birds. http://www.pureinsight.org/pi/articles. Accessed June 14, 2009.
http://www.csvohio.edu/history/japan/karakuri.html. Accessed June 14, 2009.
http://en.wikipedia.org/wiki/karakuri. Accessed June 14, 2009.
http://www://cjn.or.jp/karakuri. Accessed June 14, 2009. Kara D. A Culture of Robots. http://www.roboticstrends.com. Accessed June 14, 2009. Matthews J. Sony Spring Festival 2004 at Dediage. http://www.generation5.org/content/2004/mediage.asp. Accessed June 14, 2009. Matus D. A Robot in Every Home. http://www.hawaiibusiness.cc/hb72003/default.cfm. Accessed June 14, 2009.
http://homepage.mac.com/cparada/GML/Hephaestus.html. Accessed June 14, 2009.
http://www.theoi.com/Tartaros/Talos.html. Accessed June 14, 2009.
http://www.pygmalion.ws/stories/greek1.htm. Accessed June 14, 2009.
http://www.Keirsey.com/pygmalion/mirroroffiction.html. Accessed June 14, 2009.
http://www.dl.ket.org/latin1/mythology/3fables/love/pygmalion.htm. Accessed June 14, 2009.
http://www.bibliomania.com. Accessed June 14, 2009.
http://www.cs.umd.edu/hcil/pda/thesis/pda/node22.html. Accessed June 14, 2009.
http://www.pygmalion.ws/stories/blackboard.htm. Accessed June 14, 2009. Hart C. A. Directory of Heavier-than-Air Flying Machines in Western Europe, 850 bc–1783 ad from The Prehistory of Flight. http://www.cabinetmagazine.org/issues/11/assets/flight_chart.html. Accessed June 14, 2009. Marion F. Attempts in Ancient Times to Fly in the Air. http://www.worldwideschool.org/library/books/tech/engineering/WonderfulBalloonAscnent. Accessed June 14, 2009.
http://www.fusionanomaly.net/ctesibius.html. Accessed June 14, 2009.
http://www.history.rochester.edu/steam/hero/translators.html. Accessed June 14, 2009.
http://www.ubr.com/clocks/pub/clep/clep.html. Accessed June 14, 2009. Curtis JR. 2000. The Water Organ and Other Related Sound-Producing Automata. http://cfaonline.asu.edu/haefer/classes/564/464.papers/curtisjwaterorgan.html. Accessed June 14, 2009. Chappell U. History of World’s Fairs. http://www.expomuseum.com. Accessed June 14, 2009. Buckley D. 1868. Dederick’s Steam Man. http://www.davidbuckley.net/DB/HistoryMakers/1868DederickSteamMan.htm. Accessed June 14, 2009.
http://www.davidbuckley.net/DB/HistoryMakers/Alpha1932.htm. Accessed June 14, 2009. Szondy D. http://davidszondy.com/future/robot/elektro1.htm. Accessed June 14, 2009.
http://www.expo2005.com. Accessed June 14, 2009. Central Research Laboratories. History of Telemanipulator Development. http://www.centres.com/nuclear/manip/maniphis.htm. Accessed June 14, 2009. Robot surgery pioneer receives professorship at Imperial College. http://www.imperial.ac.uk/P3176.htm. Accessed June 14, 2009. Satava RM. 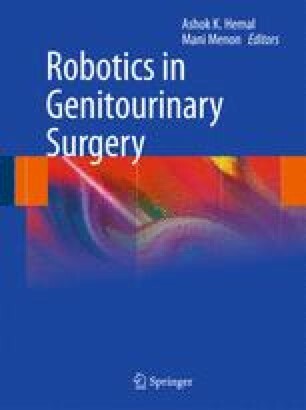 History of Robotic Surgery. The Early Chronicles: A Personal Historical Perspective. http://www.websurg.com/robotics/history.php. Accessed June 14, 2009. Stewert DJ. An essay on the origins of cybernetics. http://www.hfr.org.uk/cybernetics-pages/origins.htm. Accessed June 14, 2009. Kheng NC. HIFU Robot. http://mrcas.mpe.ntu.edu.sg/research/urobot/hifu.htm. Accessed June 14, 2009. Mazlish B. The man–machine and artificial intelligence. http://www.stanford.edu/group/SHR/4-2/text/mazlish.html. Accessed June 14, 2009.